A number of organizations made the back-to-school time a little easier for Pattonville families by donating school supplies and backpacks for the new year. Donated items were either designated for certain schools or distributed to multiple buildings in the district for schools to provide to families in need. 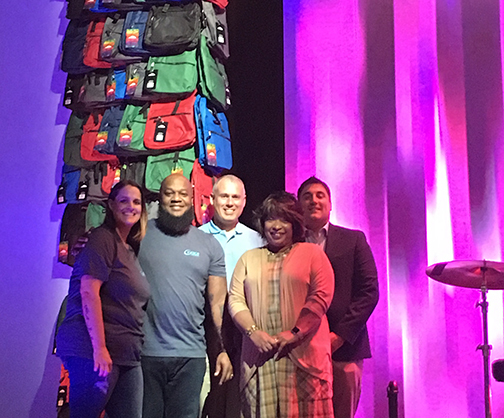 Donations included 1,000 backpacks loaded with school supplies from Grace Church in Maryland Heights and 250 backpacks donated to Drummond Elementary and Holman Middle schools by the Reebok Basketball Tournament Series and the Kids and Families in Need Foundation. School supplies were also donated by the Maryland Heights Police Department, Pattonville Educational Support Professionals (PESP), Simple Church and other individuals and staff. Families in need of supplies should contact their school office or counseling staff for assistance. Pattonville administrators and board members accept donations from representatives of Grace Church. Maryland Heights police are shown with supplies they collected from the community.